Wang Bing was born in 1967 in Xi’an. He studied photography at the Beaux Arts in Sheyang. After the Beaux Arts, he was admitted to the Film Academy; he discovered the cinema of Antonioni, Bergman, Pasolini. In 2002, he directed West of the tracks, nine-hour documentary on the end of a huge industrial area of China. A first version of five hours is shown at the Berlin Film Festival in 2003. The final version, in three parts, is projected at the Rotterdam Film Festival and distributed in France in 2004. This film is now regarded as both a masterpiece contractor and as an emblem of the opportunities offered by the advent of digital. With his film, WB crossed throughout China. 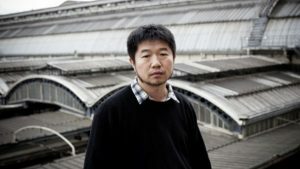 In April and May 2013, the Centre Pompidou in Paris dedicated to Wang Bing a major exhibition has the right to a unanimous ovation from critics and the public. Shangaï Youth is his 12th documentary feature.